This bar was developed by Carroll Shelby to stop shock tower flex and maintain proper wheel alignment during hard cornering. This extra support also helps prevent shock tower stress cracks. 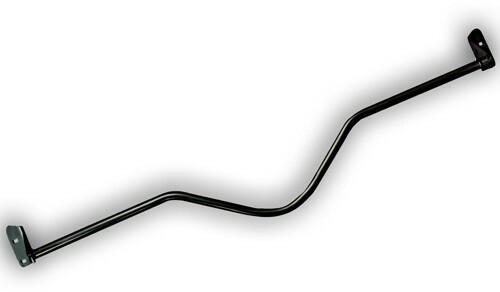 Copied from the original design, our bars feature a new thicker diameter tube and improved fender brackets. We have also stamped square holes in the top of each fender bracket to allow for the use of lower profile carriage bolts. Available in 4 finishes: Black Powder Coated, Satin Powder Coated, Bright Chrome, or Stainless Steel. Hardware not included.